Soak 10 wooden skewers in cold water for 30 minutes. Preheat barbecue grill to medium-high and grease the grates. Vodka Lemon Sauce: In a small saucepan, over low heat, combine sugar, lemon zest and lemon juice; heat gently until sugar dissolves, about 5 minutes. Let cool, then stir in vodka, oil, ginger, garlic, salt and pepper. remaining sauce aside in the saucepan. 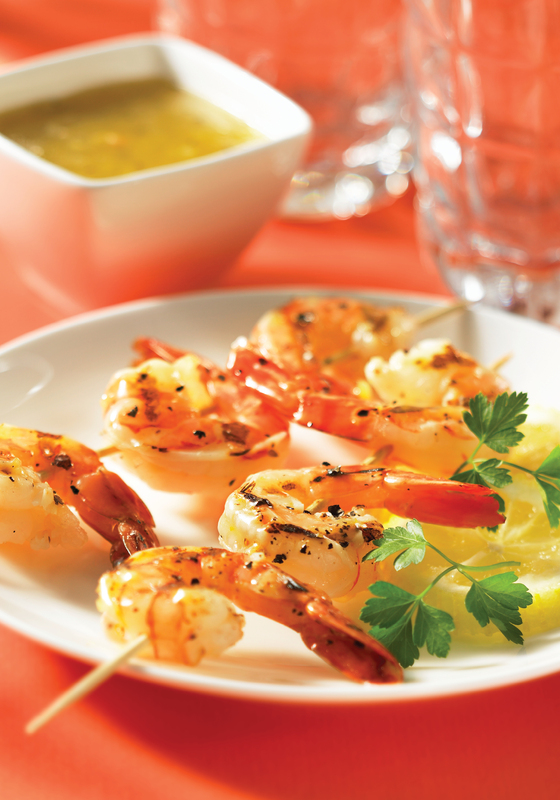 Thread shrimp onto skewers, leaving space between pieces. Grill, turning once, for 5 minutes or until pink and opaque. Arrange skewers on a serving plate. Whisk cornstarch into the remaining sauce and bring to a boil; reduce heat and simmer for 2 minutes or until thickened and glossy. Transfer to a bowl and place next to the shrimp skewers, along with small cocktail plates for your guests. Tip: When buying fresh gingerroot, look for firm pieces. If the skin is wrinkly, it’s past its best. To peel ginger, hold it in the palm of your hand and use the edge of a teaspoon to scrape away the skin, getting into all the crevices and around the knobby bits. Break the peeled ginger into smaller pieces and wrap tightly in a double layer of plastic wrap. It will keep in the fridge for a couple of weeks and in the freezer for several months. Variation: You can also cook the marinated shrimp on the stovetop. Heat a large nonstick skillet over medium-high heat. Sauté shrimp, shaking pan, for about 4 minutes or until pink and opaque. I like to give homemade gifts – which one of my children would you like? In a large bowl, combine bread crumbs and milk; let soak for 5 minutes. Add pork, garlic, ginger, hoisin sauce and chili paste. Season with salt and pepper. Stir or use clean hands to mix thoroughly. Shape into 4 patties, about 1⁄2 inch (1 cm) thick (or more if you like smaller burgers). Place on a plate, cover and refrigerate for at least 30 minutes or for up to 4 hours. Meanwhile, preheat barbecue grill to medium. Place patties on greased grill and cook for about 5 minutes per side or until no longer pink inside. 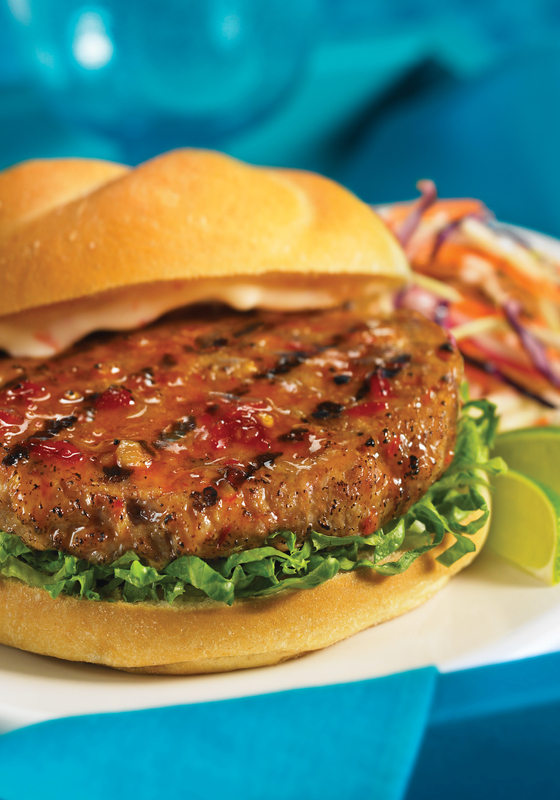 Just before the end of cooking, brush both sides of burgers with chili sauce. Spread mayonnaise over toasted buns and make sandwiches with burgers and lettuce. TIP: Asian chili paste (not to be confused with sweet chili dipping sauce) is a mix of chile peppers, vinegar, sugar and salt. It’s a great way to add heat to soups, sauces and stir-fries. It is fiery, so use it cautiously. A popular version is Sambal Oelek, usually found in the Asian foods aisle of the supermarket. A good substitute is hot pepper flakes, added to taste. Look for this great recipe and more in Fan Fare! To tenderize ribs, slice each rack in half and add to large pot of boiling water. Boil gently until ribs are fork tender (45 minutes). Drain. Stir hoisin, oyster, hot chili sauce and honey together. Generously coat ribs with sauce on each side. When ready to barbecue, spray grill and cook over medium heat, basting with sauce and turning often until well glazed, about 15 minutes. Where there’s a will, I want to be in it! The aroma of these ribs will bring your family running. A great dinner to prepare at noon, place in the oven and forget. Serve with rice and a green salad. Cut ribs in desired sizes. Layer in bottom of large shallow baking dish or roaster. Mix all other ingredients together and pour over ribs. Bake uncovered at 250 F. for 3 hours. Serves 4-6. We really don’t need any calendars – when it rains, it’s Sunday. To make rub: Combine ingredients and set aside. Place chicken in a 9×13″ pan and drizzle with oil, rubbing over chicken on all sides. Sprinkle rub, garlic and onions on the chicken, patting rub into meat with your fingers. Refrigerate at least 1 hour. To make glaze: combine ingredients in heavy saucepan and simmer 7-10 minutes over medium-high heat. Soak cedar plank in water for several hours. In small glass bowl, combine shallots, garlic, dill, thyme, cilantro, lemon zest and juice, green onions and olive oil. Cover and place in refrigerator for at least 1 hour to allow flavours to get acquainted. Place salmon on cedar plank and sprinkle with salt and pepper. Cover with herb mixture. Set plank on barbecue and close lid. Bake for 30 minutes on medium heat, until fish flakes easily with a fork. To prepare Cucumber Dill Sauce: finely chop cucumber, toss with salt and let stand for 15 minutes. Combine yogurt, sour cream, lemon juice, pepper, onion and dill. Drain water from cucumber and add to yogurt mixture. In small glass bowl, combine shallots, garlic, dill, thyme, cilantro, lemon zest and juice, green onions and olive oil. Cover and place in refrigerator for at least 1 hour to allow flavours to get acquainted. The perfect age for a child: too old for diapers and too young t drive.